The pace of technological change and innovation in all aspects of our lives is showing no signs of slowing down. Improved internet coverage, advanced cloud infrastructure and adoption of smartphones and tablets is certainly changing the profile of small business owners and the relationship they have with their accountants. This not only gives unparalleled opportunities for proactive accounting firms to help first-time entrepreneurs to grow their businesses but also helps to establish and improve their reach. In addition to the ability to analyze data in the accounting process, to be truly successful accounting firms need to be able to communicate safely and efficiently. The ability to quickly request and send information, ask and answer questions and collaborate on projects is key to any accounting firm’s success. Internal communication within accounting firms is thus a critical enabling factor for success. Also while interacting and sharing confidential information, an emphasis must be placed on the highest levels of security on internal communication. Thus the question arises, how can accounting firms make their internal communication efficient and secure to improve productivity? For the accounting industry, large quantities of data must be sent and received and team members need a way to quickly consult each other on various issues. The speed and responsiveness of communication is also a major issue and waiting for email responses just doesn’t work. This emphasizes the need for accounting firms to provide a structured internal communication approach for their teams in order to create easy and efficient collaboration. Accountants, as part of their main responsibilities, work with highly sensitive financial information. Today with cybersecurity threats, extra steps should be taken to protect this type of data, especially while communicating internally among team members. Office Chat delivers proactive security, control and IT compliance over your company’s data. All messages exchanged and files shared on Office Chat are encrypted in transit (TLS/SSL) and at rest (256-bit AES encryption). With custom data retention and deletion rules, the admins of your company control how long you want your data stored. Remote device management can be used to disable or wipeout downloaded Office Chat content on mobile devices. Two-factor authentication (2FA) security drastically reduces the risk of online identity theft. User and access management can easily add, remove or investigate users through the admin portal. Office Chat runs on AWS cloud which delivers end-to-end, enterprise-grade encryption and anywhere/anytime reliability so you can be rest assured that your official data is secure regardless of the location of your remote worker. One of the main challenges facing accountants in the modern workplace is sharing large data files securely. Technological advancement has given birth to a new age of ‘on demand’ accountants. As opposed to accounting firms that worked just 9-5, these on-demand accounting services can cater to their clients much more effectively. 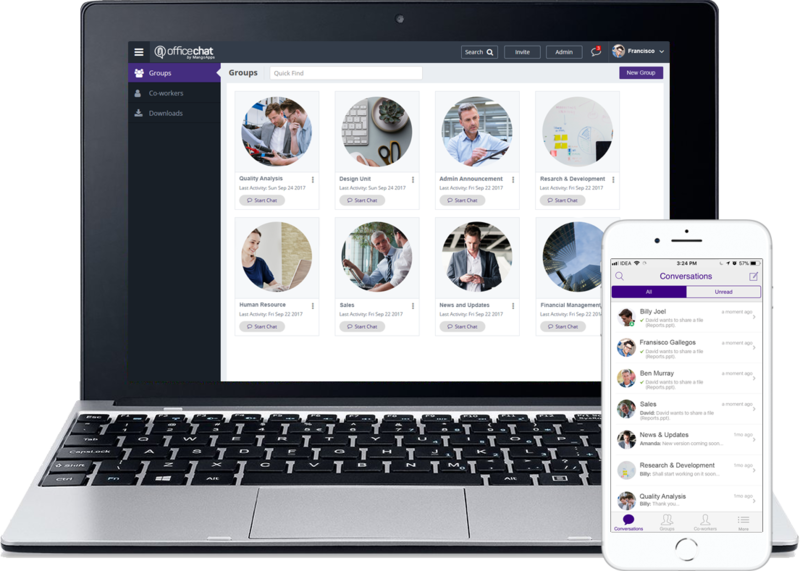 With Office Chat you can enable flexibility and accountability of your employees all the while boosting the productivity of your accounting firm. You can easily reach out to remote employees by ensuring high accessibility from multiple Office Chat platforms such as desktop, smartphone and web browser. You can use the Online Presence, Custom Status and Huddle features to stay connected with your team. Messages, files, groups and people can be easily searched within Office Chat. Despite any difference in time zones, your employees will have real-time flexibility that is not provided by emails. The Office Chat Huddle feature helps you to conduct team meetings via video conferencing using third-party applications. You can invite essential people only, set an agenda, end meetings on time and appoint presenters to keep the discussion focused during the meeting. These days, nearly everyone has a smartphone or other smart mobile device. Smartphone technology as a communication tool is of the utmost importance. So why not take advantage of the many opportunities granted by technological advancement to improve internal communication within your accounting firm?